Voice of a Crimson Angel Part III brings an end to the expansion and Chancellor Venloran has won. What were some stories that were important for you to wrap up in this book? Most important was the story of the Marconi women and Valerie Iglesias. I wanted readers to see the horrifying reality and choices Julissa and Zaneta dealt with, and I’m hoping there’s a diverse reaction to the end result. Will readers see Julissa a s a hero, a radical, a terrorist, or just a lost soul? As for Valerie, I just wanted to expand on her background. I wanted readers to feel the tragedy behind her character: a simple bookworm who wanted to have a family someday, and yet she was turned into a monster for Venloran’s own ends. These women are products of the society they live in, and I hope that was communicated through their stories. In this book, did Julissa’s character mostly writer itself, because she’s already well defined, or did you want to take her to new places? A little bit of both oddly. By the third part of the arc, her character is well-established, very true. Still, I wanted her to have one last adventure, or more specifically one last chance. There are many themes in the book, but one of the central points is Julissa’s final few choices. She is faced with the ultimatum many times in VOCA Part III: escalate the violence of the war or take a step back. That’s why I added several scenes with her and David Armano. Julissa’s anger and pride are both weapons against herself and her enemies. One of my favorite scenes in the book will forever be the horse-riding scene between the Marconi mother and daughter. Though this may be their end, I believe readers will appreciate the journey Marconi experiences. I found this book to be thrilling and savage. Was this a fun book for you to write? The VOCA trilogy was fun as all hell to write. Writing books is fun for me in general, but some are more stressful than others to write. EOK Part III: Ballad of Demise was one of the most difficult to write, namely because the enormous changes to the story I added in after the outline phase. VOCA Part III: Remembrance was fun because the vision pretty much stayed true to my original outline. Not only that, but I finally got to explore some of the more obscure moments in the history of the UNR. Basically, fleshing out the lore beyond references and actually showing it. Reverence and EOK had battles within forests and buildings, and now in the VOCA trilogy whole cities are now theaters of combat. This was the vision I had for the book, at times claustrophobic, and other times epic. What are you currently writing and when will it be available? I try to stay busy, and I’d like to think I’ve outdone myself. Not to brag, because it took many sleepless nights, pots of coffee, and early morning runs to get it all done. Well, close to being done, because I’m still not quite there yet. First things first, on May 31st Avenge the Silenced will be released. It is currently in the editing phase and will be available for a preorder by April 1st. Beyond that, the next chapter in the saga is being written, codename Scourge of Men. It will explore many new characters while also expanding on many formally obscure characters. Perhaps most important of all, Scourge of Men will explore Secretary General Vanzetti and his own empire, the Allied European Federation. The Expansion is over. Chancellor Venloran has won. Julissa Marconi, however, is not done fighting just yet. If she cannot claim victory, then she and the Crimson Angels will claim revenge. With Mexico lost, the resistance decides to strike at the homeland itself. Unable to turn back, Julissa and her fellow soldiers are now in for the fight of their life. In the final weeks of 2051, a new war will be fought that will test the limits of both sides. There will be no justice or mercy. This decisive battle will be decided by whoever gives into their full, unrestrained, savagery. Prepare to read the heart-stopping final entry in the Voice of a Crimson Angel trilogy. Complete the tale that expands on the Reverence saga. 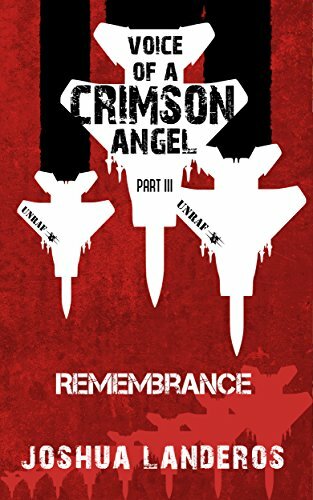 Voice of the Crimson Angel is the final installment of the prequel series to the ongoing Reverence saga. Joshua Landeros returns with all the sound and fury of his sci-fi military thrillers, but we find our heroine, Julissa Marconi, on the defense having lost to Chancellor Venloran previously. The resistance is going to have to dig deep as they find themselves cornered, unable to retreat and unwilling to give in. It will be up to either side or who is willing to sacrifice their humanity in order to win. Landeros has continued to thrill and amaze with this prequel series, especially with the expansion of his near-future world. 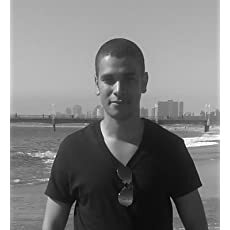 His characters are desperate and heroic, even if they give into their more violent natures. The action is brutal and quick, the pacing crisp and fast. At times, I was thrilled I’d read more than I had originally aimed, because I didn’t even realize how quickly pages were flipped. Julissa is a fun character and one that I am sorry to leave behind as this series comes to a close. Landeros does a good job of making everything balance on a knife’s edge with tension and also does not shy away from wrapping everything up so as to naturally lead into his Reverence series proper. The brutal efficiency of our cyborg soldiers alongside their quiet humanity is a fun dichotomy and one of the reasons why this series remains so fun to come back to. The only things I won’t miss from this, is the telling of a story that is already somewhat understated in the previous books. And I won’t miss Chancellor Venloran as an antagonist. Landeros has the skill to do more and expand even further into his world, so we should be able to leave this prequel series behind and forge ever on into the future. Fans of Landeros will not be disappointed and readers who enjoy military science fiction or even political thrillers should be able to feel right at home here. Buckle your seat belts for a thrilling last ride with Julissa Marconi.